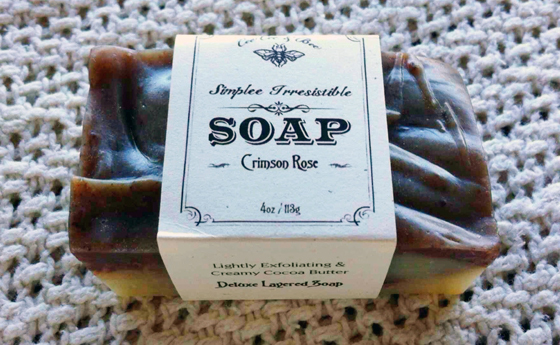 The Crimson Rose Cocoa Butter Soap is a treat for your skin. It has lasted me so much longer than other natural, artisan soaps have, and this soap will give you a sudsy lather to rival the best of them. I still have the majority of the bar and I use it quite a bit: four weeks and counting now! Rich and nourishing, the high volume of cocoa butter really works well with the rose, rose hips, and castor oil for a nice clean feeling that feels decadent and efficient all at the same time. 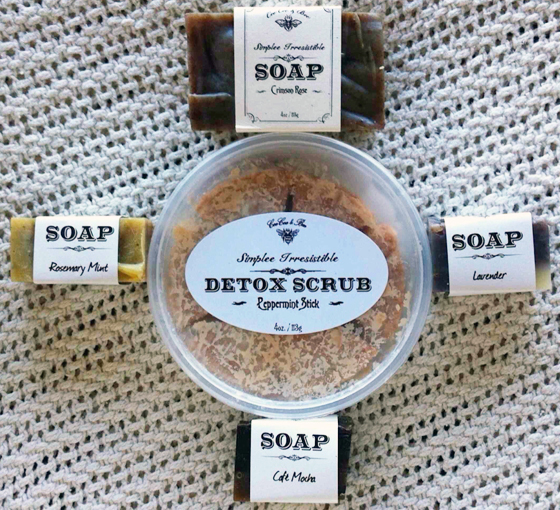 $9 for a generous block of premium artisan soap, and you’ve got yourself a really nice present for your shower or someone else’s. Last, but certainly not least, the Peppermint Detox scrub was a no-brainer buy for me: the amazing, uplifting smell of peppermint in my shower? Yes, please. Plus, anything with “detox” in the title and I am sold. Say no more. And at a modest $10 per container, it was pretty much begging me to give it a try. The scrub is cut up into individual “serving” sizes: seven, to be exact. I have been using one per week, and my skin has been thanking me. I really loved the process of mashing it up in my hands in the shower, getting a little water on it, and then really working it into my skin. It exfoliates well without stripping my skin at all: instead my skin is left smooth, but not filmy. Seriously, ask my skin, it sent CeeCee & Bee a thank-you letter. Really: baby’s bottom! Note that the scrub is currently sold out of CeeCee & Bee’s Etsy page, so check back soon if you’d like to pick it up for yourself. Charlene was generous enough to share the recipe for another detox scrub with us, the Grapefruit Eucalyptus Sea Salt Scrub. YUM! What a treat: let us know if you make it! Start by shredding 2 tbsp. of Simplee Cleen Soap in Grapefruit Eucalyptus. In a double boiler, melt 2 tbsp. of cocoa butter mixed with the shredded soap. The soap shreds will not melt completely. Once the cocoa butter is liquefied, add the coconut oil and stir until all oils are liquefied and remove from heat. Allow oils to cool on countertop. In a separate bowl, whisk together the castor oil, essential oils and vitamin E. Once the other oils have cooled yet are still liquid, add them to the bowl of castor oil mixture. All at once, add the baking soda, bentonite clay & sea salt. Stir until well mixed. The consistency will be very thick and clumpy. Spread mixture out onto a small cookie sheet or soap mold. Immediately cover with wax paper and refrigerate for 30 minutes or up to two hours. Remove from refrigerator and either remove from the soap mold, or I prefer to cut mine into small wedges which are easy to bring into the shower and use one or two at a time. This recipe can be changed up to use any of your favorite soaps or essential oils. The baking soda, sea salt (or optionally, you can use epsom salt) and bentonite clay all help to detoxify your body while the castor oil aids your body in absorbing the minerals and beneficial oils. Shredded soap is added for extra cleansing power while antioxidant rich cocoa butter and coconut oils leave your skin feeling silky and moist all day long. 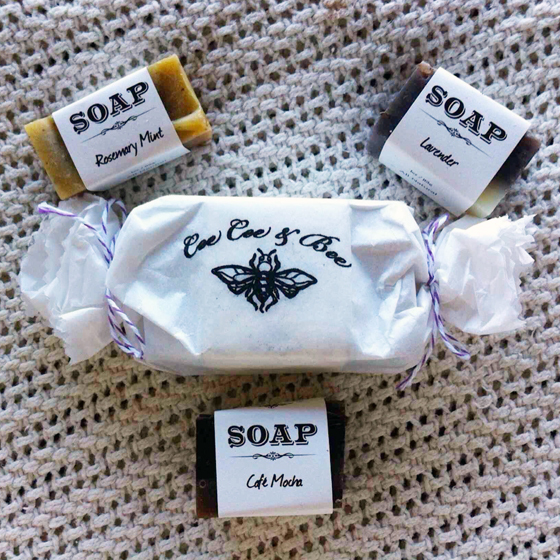 Use code UNSULLIED2014 for 20% off CeeCee & Bee products until the end of 2014! I was lucky enough to win Natural Kath’s CeeCee & Bee giveaway and I’ve been anxiously waiting for my current bar of soap to run out so I can get to trying them! 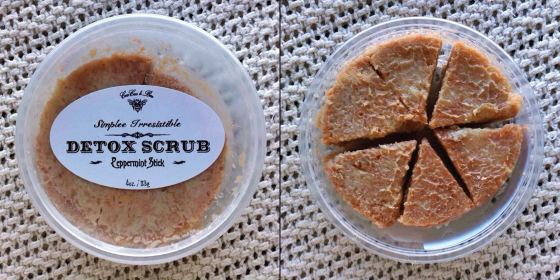 Anddd I’m even more pumped now, haha The scrub recipe sounds awesome too…definitely going to give it a try! Anything with “detox” in the title and I am totally on board! The scent is so yummy too! Ana, I know! I love the look as well- such a lovely presentation! I still have them too and use them everyday, they certainly last a gal a good while, which is nice! Great review! So excited to have been the one to introduce you to them, and thank you for the mention! I love your blog, so it’s extra exciting to see my name in a post. Going to Pin that scrub recipe. We love your blog! :0) I know, I can’t wait to try the recipe! How awesome was that of them to make the code valid for so long? :0) Too great! I love the packaging. The idea of cutting up the scrub into pieces is so quirky. Looks like cake I’ll have to try out the scrub recipe soon too. Thanks for sharing! I love this post! The ideas are great! Thank you for the recipe! The soap seems really wonderful! Thank you for sharing the recipe! It is something that I would love to make myself! Leyton Carpet Cleaners Ltd.